Today we have the absolute privilege of hosting Mary DeTurris Poust’s blog tour here at My Catholic Blog. 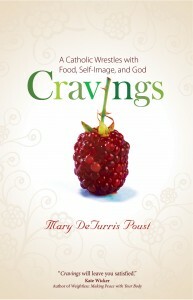 Mary’s blog tour is part of the launch for her latest book, Cravings: A Catholic Wrestles with Food, Self-Image, and God. My Catholic Blog will be giving away a copy of Cravings: A Catholic Wrestles with Food, Self-Image, and God to a lucky commenter on this post. All you have to do is leave a comment on this post to be entered into the contest. We will be picking our winner on Monday January 14th. Also in addition to the book giveaway, Ave Maria Press is giving away a $100 Williams-Sonoma gift card. You can enter to win it here and may do so once a day until the 20th of January! Cravings offers a Catholic perspective on the relationship that exists between food and spirituality. Mary shares her own individual experiences with food, and also the experiences of other Catholics. By using these examples she paints a perfect picture of how Catholics can create an approach to eating that works for them. To make the connection between spirituality and food Mary believes that, “the physical hungers that lead to constant snacking and high-calorie meals often mask something much deeper, a spiritual hunger that can never be satisfied with anything we buy at the grocery store.” You can learn more about Cravings, Mary’s inspirations as a writer, and her other work as well in the interview below. Mary DeTurris Poust is an extraordinary individual and we are so happy that we could interview her on My Catholic Blog. – Where did your inspiration come from for Cravings: A Catholic Wrestles with Food, Self-Image, and God? Initially the inspiration came from my publisher, Ave Maria Press. My editors believed in this topic and in my ability to write about it, so I have to thank them for their vision and their confidence in me. Once the book progressed from idea to reality, however, my inspiration came from the people who shared their stories with me. With every story, I became more and more convinced that this book could really help people get to the bottom of their food issues while strengthening their relationship with God. And I experienced that in my own life. I followed the practices I outline in Cravings as I wrote the book, and I noticed a dramatic shift in my spiritual life and in my relationship with food. – I can see how food and self-image are closely related, but where do you see God as fitting into that picture? I don’t see God so much as fitting in as holding it all together. We absolutely cannot face food or self-image issues without bringing God into the picture and without delving into our spiritual life. We often separate our lives into compartments: my physical self (where food fits in); my emotional/mental self (where self-image fits in); and my spiritual self (where God fits in). When we try to tackle just one area without the others, something – or someone – suffers. So we need to look at our lives from a more “holistic” place and really start to see how one area affects the others. Are you hungry for potato chips, or are you hungry for happiness, for peace, for self-acceptance? When food becomes a substitute for something else, we run into trouble. I think many people in our society are hungry for something more in their lives, and that involves getting to know God on a deeper level, not getting to know Ben & Jerry. So God is intimately and critically involved in our relationship with food and our self-worth. – What is the main message that you hope readers will take away from Cravings: A Catholic Wrestles with Food, Self-Image, and God? If I had to sum up my hope for this book in one line it would be this: I want people to come away from Cravings knowing that they are loved by God for exactly who they are right at this moment. That doesn’t mean they might not want to improve in some areas or work on issues that have been plaguing them, but that they know deep down that even if they don’t lose the 20 pounds, even if they never fit into their old jeans, even if they continue to battle whatever demons drive them to use food (or alcohol or shopping or gambling or any number of things) as a weapon against themselves, they are beautiful and beloved in God’s eyes. We are “wonderfully made,” as we hear in Psalm 139. When we can learn to start from that place of love and acceptance, powerful things begin to happen. The bonds of self-hatred and food obsessions are broken. – When did it dawn on you that writing was something you truly loved? I had been a good student in English or language arts classes as a kid, although I didn’t love to write and I certainly didn’t see it as a career path. Then in my freshman year at Pace University, my English professor (a Catholic sister, even though it wasn’t a Catholic college) suggested I might want to think about writing as a major and a career. It kind of blew me away. I don’t know if that thought would have entered my mind if she hadn’t planted the seed. And so I declared English as my major with writing as my concentration. I really planned on using my writing in a business field – marketing, advertising, public relations, but then I walked into my first college journalism class and everything changed. I knew I wanted to write for newspapers or magazines and set out to make that happen. – You have written in several different forms including newspapers, magazines, journals, reports, and books. Do you have a preference when it comes to writing or do you enjoy it all? What are some similarities and differences that you have found? I really have written for just about every type of publication, all the things you mentioned and then some. Prayer books, annual reports, cable TV scripts, fund-raising appeals. You name it and I’ve probably written it. When I started out, my first love was feature writing for newspapers, especially personality profiles. I loved meeting people and then telling their stories. In more recent years, my writing has taken a decidedly spiritual shift. I wanted to write less about the business of the Catholic Church – controversial issues, latest happenings, etc – and more about the heart of the faith. That transition was really prompted by the time I spent writing “The Complete Idiot’s Guide to the Catholic Catechism.” That book project was as close as I get to a “conversion experience.” It made me want to focus my writing on helping people walk the spiritual path. That being said, I do think my many years as a journalist paved the way for this. I continue to write for newspapers, magazines, and other publications even as I write my books, and I try to blog daily at my own blog, Not Strictly Spiritual. The common thread in all of it is honesty and a willingness to put myself out there in front of my readers. No matter what I write, I write from the heart and from my truth. – For anybody who hasn’t seen the TV show, Guided by Grace, that you co-host, can you explain what the show is typically about? – So Cravings: A Catholic Wrestles with Food, Self-Image, and God is your sixth book to be published. That’s awesome and impressive! What can we expect next from Mary DeTurris Poust? Right now I’m focusing on getting the word out about Cravings and my other new book, “Everyday Divine: A Catholic Guide to Active Spirituality,” which came out just a few weeks before Cravings. 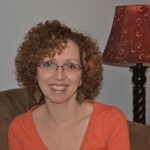 That book focuses on weaving prayer into everyday life, and that’s something I’d like to write more about on my own blog Not Strictly Spiritual (www.notstrictlyspiritual.com) and for other publication. I’m also hoping to do more speaking engagements and retreat-type events related to Cravings and Everyday Divine because I think part of the power of those books is putting them into daily practice, and sometimes that takes a little push. I’d like to give people the push they need to take that next step on the spiritual path. And I’d like to walk with them. I always tell people that just because I’ve written all these books doesn’t mean I’ve got it all figured out. I’m on the journey, too, and talking to readers – in person, by email, on my blog – is a gift and a blessing. I just posted a recommendation for this book on the SparkPeople website, a weight loss site that deals with all the various aspects of weight loss and fitness. Hopefully this will add the spiritual dimension to their already excellent coverage of the topic of fitness. Blessings Mary and Brendan for your wonderful coverage of this topic. Hi Christy, that’s wonderful. Thanks for your continued support! Thank you! I used to use SparkPeople. Thanks for reminding me. I think I’ll head over there. Thank you so much for the interview and giveaway! No problem Tonia, this was a terrific interview we had with Mary. Mary’s books are always wonderful and a source of inspiration to me. So many people suffer from eating disorders and a disordered relationship with food. This book will help many people who need to find a way out of the misery of food issues. Great interview and I look forward to reading more! Hi Jeanne, and you are so right, and thanks for your comments. Mary was a super interview (and we are always looking for more authors to interview). As more families and generations become “conditioned” by food — and as habits become ingrained, it’s a tough battle. We passed around Mary’s book throughout the office. Looks like a wonderful book – thank you for the giveaway opportunity. What a great message, especially for young people who struggle so much with their self-image. I’m recommending this to several people I know and posting on FB. I also love our blog! God bless! Please enter me for the chance to win this wonderful book! This inspires me in a way that promotes spiritual growth, not just willpower Christianity, a change in viewpoint, not just a change of habit.